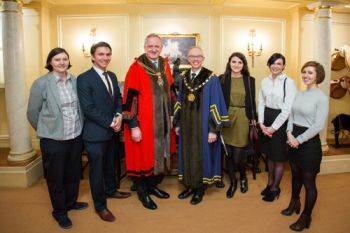 Olive Hopkin, who recently graduated with a MSc in Information Systems & Technology, received the Award from the Worshipful Company of Information Technologists, the youngest of the livery companies. 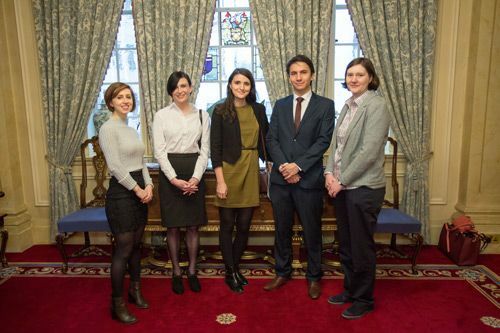 City alumna, Olive Hopkin, has won the Silver Award from the Worshipful Company of Information Technologists (WCIT). Olive graduated in January 2017 with an MSc in Information Systems & Technology (Distinction). She was selected from a cluster of nominees for the Gold and Silver Awards. They were invited on 22nd February to the WCIT’s 95th Business Lunch, at Saddlers Hall in the City of London. Olive, who is delighted to have been nominated for the Award, was actively involved in extra-curricular events during her time at City. She participated in the City-Visa Europe’s design jam competition in October 2016 in which she and her team designed an innovative payment system for teenagers in 48 hours. Olive also took part in J.P Morgan’s Code for Good 24-hour Hackathon in 2016 and worked as part of a team improving a data analysis information tool used by the Save The Children charity for documenting and tracking the stock management of nutritional supplies for children in war-ravaged and disaster-affected nations. “I am pleased with Olive’s success in getting this Silver Award. She was an excellent student and was fully engaged with her degree programme and the life of the university. She served on the staff student liaison committee and the WCIT has fittingly recognised her achievements”. Olive’s Silver Award comprised £250 and a certificate. The livery companies of the City of London, currently 110 in number, comprise London's ancient and modern trade associations and guilds, almost all of which are styled the "Worshipful Company of..." their respective craft, trade or profession. London's livery companies play a significant part in City life, not least by providing charitable-giving and networking opportunities. Liverymen retain voting rights for the senior civic offices, such as the Lord Mayor, Sheriffs and City of London Corporation, its ancient municipal authority with extensive local government powers.